* November 30 (N30) is an important day in Philippine history. In 1863, it was when Filipino revolutionary and founder of Katipunan, Andres Bonifacio, was born. 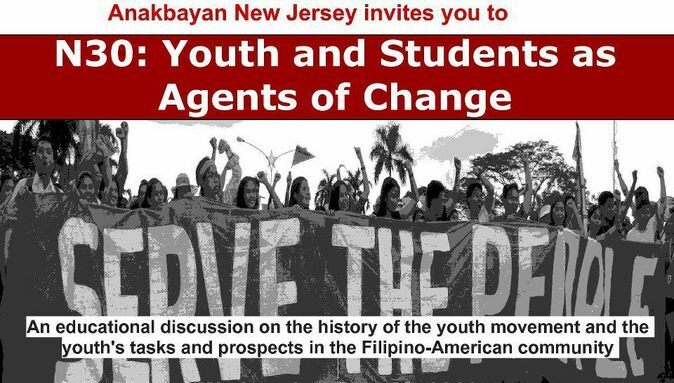 In 1964, it was when the revolutionary youth and student organization, Kabataang Makabayan (KM), was established. 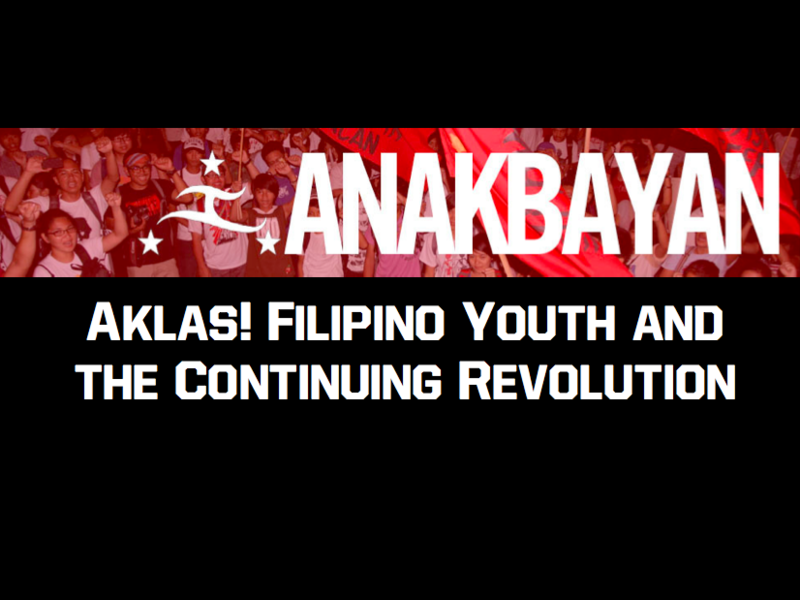 In 1998, in the spirit of the revolutionary tradition of Bonifacio and KM, Anakbayan was formed. The Filipino youth come from a long line of inspired, militant leaders who engaged in the struggle for change and national freedom. This workshop celebrates Filipinos like Jose Rizal, Carlos Bulosan and Philip Veracruz, and empowers US-born and immigrant Filipino in their search for identity, community and social justice. * Amado Guerrero’s “Philippine Society and Revolution” is the primary historical document that tells the story of the Philippines from the perspective of the Filipino masses. It provides great insight on the evolution of Philippine society from the pre-colonial period to the present, and the Filipino people’s duty to fight for genuine freedom and democracy. To truly and correctly serve the people, we must learn our history. Understanding and appreciating our people’s rich history will unleash our collective strength for forging change in our homeland. *November 16 is the anniversary of the Hacienda Luisita Massacre. Out of the 4,000 farmworkers who staged a strike against exploitative working conditions, 14 were killed, hundreds were injured by the Philippine military. No one was made accountable for these injustices. 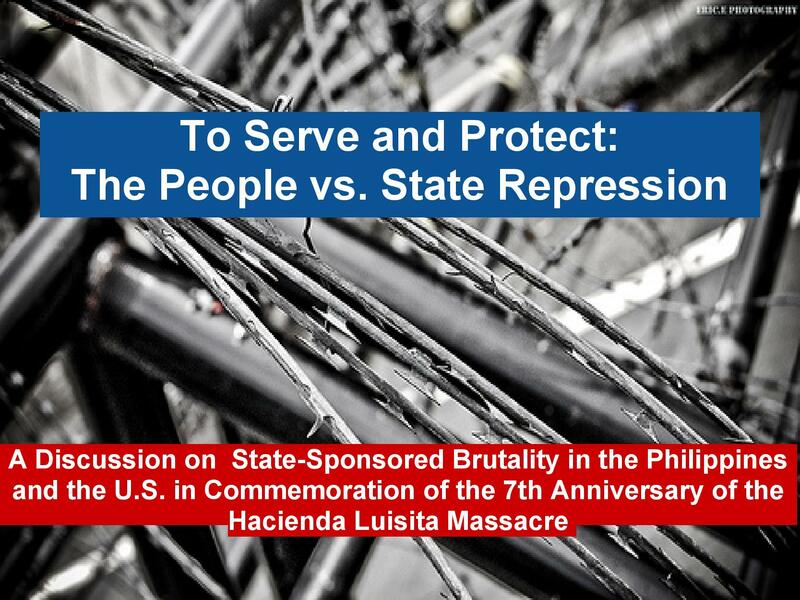 This workshop delves into the question, “Whose interests does the State really serve and protect?”– State Repression, our rights as citizens in the face of oppressive police and armed forces, and how we can achieve justice for victims of state-sponsored brutality. * An estimated 4,500 Filipinos leave the country each day to find employment abroad. Through the government-sponsored “Labor Export Policy” [http://www.youtube.com/watch?v=2SNE5ZphHYo], Filipino workers are sent out to fulfill “job orders” from foreign-based corporations and agencies, which put them at risk for various forms of exploitation. This discussion and workshop sheds light on the plight of Filipino migrants in the United States. 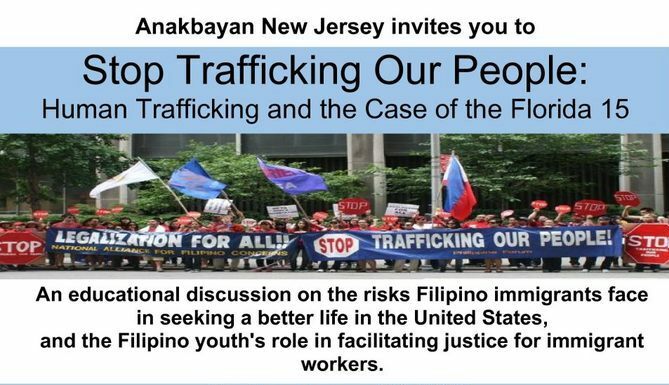 It also provides an opportunity for the Filipino youth to actively participate in fighting for justice for the F15 and other trafficked workers. “Aklas!” is the Filipino word for revolt. 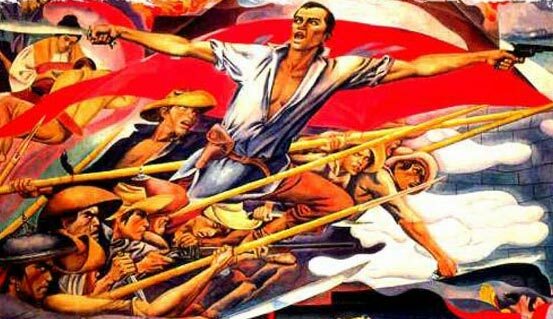 As Filipino-Americans, we came from a people of revolutionaries, past and present. In this workshop we will learn about our people’s revolutionary heritage and history, from the anti-colonial struggle of the Katipunan to the present day’s struggle for genuine independence and democracy for the Philippines. We will also examine the role of the Filipino youth in the past and our continuing role in the present, both here in the U.S. and back home in the Philippines.